Why Did Jesus Protest Washing Hands Before Eating? Now if you work in the food-service industry, hopefully it's not news to you that public health laws require employees to wash their hands before handling food; similarly, restaurants are required by law to wash their pots, pans, dishes, cups and utensils to avoid spreading food-borne illnesses to customers. And assuming you're not a pre-teen (who often act as if dishwater is toxic, where doing the dishes will absolutely KILL them! ), such practices are seen as just plain good ol' common-sense: in modern times, humans accept that although unseen with the naked eye, viruses and bacteria DO exist; such organisms can be spread via food which serves as a vector for transmission from wherever they may be found (e.g. dirty hands). Given our 21st Century perspective, we tend to take for granted the benefits bestowed by the centuries of scientific studies that have confirmed the benefit of safe food-handling hygienic practices, where all modern countries have passed laws requiring such measures be put in place to protect public health. These measures effectively reduce morbidity and deaths resulting from easily-preventable cases of food-borne illness. So why does Mark 7 (and the book of Matthew) portray these early Jewish hygienic laws as if they serve as some damning indictment against the Pharisees, as if they're concrete proof of the Pharisees having an unhealthy obsession with silly, ineffective rituals? Do the authors of Matthew and Mark actually believe the hygienic practices they denounce didn't have efficacy or utility, being simply no more than ancient superstitions of ignorant men? And did Jesus actually believe the same? Why did Jesus denounce hand-washing before eating? First though, we need a quick review of the beliefs of the Pharisees, a powerful and influential sect of Judaism. Jesus' rants directed against the Pharisees and their 'excessively-burdensome man-made rules' weren't unique to him: similar complaints were voiced by many Jews even before Jesus was born, as the Pharisees had increasingly dictated all aspects of Jewish civil life via their 'oral law' traditions. These oral laws went well-beyond the thread-bare rules found in the 'Law of Moses' (AKA the Torah, the first five books of the Old Testament found in the Christian Bible). By protesting these rules, one gets the distinct impression of Jesus being analogous to a modern-day libertarian, i.e. the type of person who rails against 'Big Government intrusion' into their personal lives, objecting to erosions of their civil liberties. They often protest 'Governmental over-regulation', just as Jesus protested the Pharisees and their theocratic over-regulation. Now it was one thing when the Pharisees inserted their extra-scriptural dictates when defining the rituals to be used in Temple worship (often done in the name of standardization, lending a measure of consistency from one service to the next, e.g. consider how Sunday meetings are consistent at Kingdom Halls Worldwide, even though the Bible doesn't stipulate such details). But when the Pharisees inserted their extra-scriptural rituals into the routines of daily life (e.g. eating), for Jesus, that was the proverbial 'straw that broke the camel's back'. As a faithful observer of the Torah, Jesus rightly protested: there's no mention of washing hands before meals anywhere in the scripture. And for that matter, the scripture only requires offering thanks to God "for the good land": the scripture doesn't command thanking God for the FOOD itself, per se (depending on the punctuation used in whatever translation you're reading: it's nebulous, since the ancient Hebrew language didn't include punctuation marks). So Jesus had a valid point. But despite Jesus' constant diatribes against them, history indicates the Pharisees actually enjoyed widespread support amongst the Jewish populace (esp. those who worked in the trades). Hence the Pharisees were the party of the people, the common laborer and tradesmen, the ones who actually worked with their hands (and got them dirty, as a result). History also reveals the Pharisees ended up as the Jewish sect which survived and prevailed, since the more-elitist Sadducees were wiped out when Rome seized Jerusalem and destroyed the Temple in 70CE; they had outlived their usefulness to the Romans by failing to prevent uprisings, requiring Rome to send additional troops to the area to suppress. So with the Sadducees out of the picture, the Pharisees won the battle for control after the Jewish-Roman wars came to an end, simply by being 'the last sect standing' (the Essenes were the 3rd major Jewish sect in 1st Century CE, but being monastic, they were quite content to live as celibate monks in remote desert caves, far-removed from the urban centers where the Sadducees and Pharisees were duking it out for gaining control in the Sanhedrin, the Jewish court). So despite Jesus' attempts to fire up the masses against the Pharisees, there actually was little protest against the concept in rabbinical tradition that claimed God gave Moses TWO sets of laws: an ORAL set, which explained the rationale behind the WRITTEN set God directly dictated to Moses (said to have been written during the 40 days Moses spent atop Mt Sinai). Even today, rabbinical Judaism observes BOTH sets of law, with the ORAL set amplifying or 'fleshing out' specific details which harmonize with the broader principles found in the WRITTEN Torah. The situation is analogous to the US Constitution containing core principles, whereas Federal, State, and local civil and criminal codes are needed to 'flesh out' the principles into actual statutes (if only so Highway Patrol officers don't have to deal with speeders complaining that giving them a ticket for driving 100 MPH in a 35 MPH zone would be infringing on their "pursuit of happiness"). As that example shows, broad principles are fine when serving as statements of lofty goals and values, but they make horrible statutes due to their lack of specificity; their usefulness is to serve as guideposts to control the content of statutes. So then, as now, many religious Jews accepted these oral laws without question; many didn't see them as merely "man-made rules" created by their duplicitous rabbis (as Jesus alleged). Instead, they considered oral law to be every-bit as 'God-inspired' and binding upon them, standing on equal footing with the laws found in the written Torah (which weren't meant to be exclusive, but merely representative of the types of laws to be created within the oral laws). Furthermore, rabbinical Judaism asserts God demanded oral law be handed down to successive generations of Hebrew youngsters by their elders (typically rabbis): that's what Mark 7 is referring to when it cites 'the traditions of the elders'. Memorization was needed so that, in a phrase taken from Isaiah, "God may write the law onto the hearts of the people" (an idiom quite similar in meaning to the modern-day expression, 'to memorize by heart'). But despite oral prohibitions forbidding oral law from being placed into writing, the threat of Judaism's oral law tradition becoming forgotten became a distinct possibility in the late 2nd Century CE under the Roman Empire, doling out religious persecution of Jews (which was at it's peak, following the second failed Jewish uprising in 132CE). The religious practice of Judaism had been outlawed in many parts of the Roman Empire during the 2nd Century CE, and oral recitation was simply asking for trouble: young Jewish boys overheard reciting the oral Torah in an attempt to memorize their lessons would mean certain death for all parties involved, both rabbis and students alike. And under the constant watchful eye of their Roman overlords, even whispering was likely viewed with great suspicion: the oral law tradition was in serious jeopardy of being forgotten. Thus the leadership of the Pharisees reluctantly decided to commit the oral Torah to writing, so that it may be preserved for future generations. Dating from circa 200CE, the Mishnah was the end-result of much scribal efforts, containing a written record of not only the much-older oral laws, but also containing discussions amongst rabbis of various legal cases where they each offered interpretations and opinions for proper application of the written Torah. And while no modern-day Jew literally believes ALL oral laws date back to the time of Moses, that's not their position: oral laws are seen as being interpretive in nature, such that although the principles in the written Torah ARE everlasting, the oral laws SHOULD be adapted to address current needs (including discarding the long-standing oral prohibition itself that forbid placing the oral law in writing). So unless the written Torah explicitly states a commandment (e.g. 'Thou Shalt') or a prohibition ('Thou Shalt Not'), oral law allows judicious use of discretion in implementing a new law consistent with some guiding principle contained in the written Torah. It's also important to consider the political dynamics involved, the "power plays", the alliances and coalitions being formed (and as entertaining as any typical reality-TV show, e.g. "Survivor"). In denouncing the Pharisees and their oral laws, Jesus wasn't some lone voice crying out in the wilderness: the Sadducees also believed the written Torah to be the sole recording of God's will, and they joined Jesus in denouncing the oral law tradition. It's likely the Sadducees viewed the Pharisees with suspicion, sensing an attempt to exercise greater control over the unwashed masses by operating under the banner of Divine authority. Worse, the Pharisees tried to tell the Sadducees how to operate the Temple (many of the High Priests were Sadducees). However, the Sadducees rejected OTHER concepts that were important to Jesus, e.g. they didn't believe in the resurrection of the dead, or that souls survived death, for the same exact reasons they cited for rejecting the Pharisaic oral law tradition: there's a complete lack of any supportive evidence for such concepts to be found within the written Torah (at least, not without resorting to some heavy-duty scripture-twisting). In making their case, the Sadducees also cited the passage in Deuteronomy 12:32 which says no attempts should be made to add to or diminish the Torah. In other words, the Sadducees objected to blending 'foreign' religious concepts into Judaism, where belief in resurrection of the dead and souls that survived death were elements that can be directly traced to Zoroastrianism, the official State religion of the Persian Empire (Jews were first exposed to their beliefs over 500 years earlier, following their liberation from Babylonian captivity by the Persian ruler, Cyrus the Great, who was acclaimed as 'messiah' by the post-exilic inspired writers of the Old Testament). Such 'pagan' influences were seen as a threat to 'true worship', as evidenced by the many polemics appearing in the Old Testament warning against allowing such 'false' beliefs to 'pollute' true worship. However, the Pharisees believed in both resurrection and souls that survived death: these were among THEIR central tenets, and these concepts obviously had great appeal to Jesus (despite no references to either being found in the written Torah). So being neither fish nor foul, Jesus was a Jew without a major Jewish sect with which to align; by rejecting central tenets important to BOTH groups, Jesus was split right down the middle with each. Now, it's quite likely the oral laws recorded in the Mishnah have changed since Jesus walked the Earth, but such an issue is irrelevant to the question at hand, since the ONE oral mandate Jesus specifically objected to IS repeatedly stated in the New Testament (in Matt 15 and Mark 7), and it hasn't changed: washing of hands before meals. Netilat yadayim ("Raising [after ritually washing] the hands"), also known as Mayim Rishonim, which is done with a blessing prior to eating any bread with a meal. During a Passover Seder, a third washing of netilat yadayim is performed without any blessing being recited, before the eating of a vegetable, called karpas, prior to the main meal. bodily cleanliness and of removing human impurity - see Netilat yadayim above. To remove tumat met ("impurity from death") after participating in a funeral procession, or entering a cemetery, or coming within four cubits of a corpse. From our modern perspective, all of these practices seem benign, if not actually beneficial (although perhaps overly-cautious, reflecting a rabbinical tendency for cleanliness bordering on a clinical diagnosis of obsessive-compulsive disorder (OCD), due to a phobia of "impurity"). But despite having a multitude of trivial rules from which to select to use as an example of how the Pharisees had inserted their ritualistic practices into the routines of daily life, which specific example did Jesus target, but the ONE that later was vindicated by modern science as actually possessing merit (as I said earlier, is even required by law for occupations that handle food)? Why didn't Jesus protest the following hand-washing rule (mentioned in the Wikipedia article, above), which similarly is not found in the written Torah, intrudes into religious practice, and offers no protective health benefit? (Levites) before uttering the Priestly Blessing in front of the congregation. The answer is obvious, if you read the rest of Mark 7 carefully: Jesus didn't choose the issue of hand-washing before meals, but the Pharisees brought it up to HIM, asking Jesus why his disciples didn't wash their hands before eating. In his response, Jesus specifically dismissed the ONE hygienic practice that later was PROVEN to be beneficial (and hand-washing actually SAVES countless lives). But just so there was no ambiguity or confusion over his position, Jesus even called a large crowd to hear him repeat his diatribe: Jesus was going 'all in' on the point. Thus Jesus and the authors of Matthew and Mark dismissed the early hygienic practices of the Jews that truly were revolutionary and ahead of their time, even possibly able to serve as evidence to non-believers that the Jewish men who started the hand-washing tradition actually might've had some Divine insight guiding them to create such rules, relying on God-given knowledge which science verified some 1,500 years later. So why would Jesus attack hand-washing? Jesus simply didn't know anything about the world of microbiology, or the existence of pathogenic (disease-causing) microorganisms. And if Jesus, the Pharisees, Sadducees, Essenes, et al disagreed on the value of the Pharisaic oral law tradition, there was ONE thing EVERY member of the 1st Century CE Jewish community COULD agreed upon: the CAUSE of disease. 27 The Lord will afflict you with the boils of Egypt and with tumors, festering sores and the itch, from which you cannot be cured. 28 The Lord will afflict you with madness, blindness and confusion of mind. That's what modern people might call, 'the Sin Hypothesis of Disease', where Jews believed God struck humans with whatever disease He deemed fitting as punishment for committing sins (God's other options for punishment are listed ein Deuteronomy 28, including: sending the sinner into slavery, military defeat, crop failure, loss of livestock, death of family members, even the death of the sinner). In Deuteronomy 28, God proudly takes credit for causing ALL human diseases, ALL disabilities, ALL physical and mental illnesses, due to the afflicted individual supposedly having committed some sin, or even as punishment for the sins committed by one's forefathers (King David's infant son was said to have died of a disease which the Bible describes as David's punishment for having arranged the death of Bathsheba's husband, so he could carry on an affair with her. David's innocent son died for his parents' immorality, just so they could be taught a lesson). And perhaps this is a good time to examine what koinoó (the Greek word translated as 'defile' in English) meant to the Jewish audience whom Jesus was addressing. In the 1st Century CE, Jews were very familiar with the concept of unholiness and desecration; these contrast with the condition of being holy or consecrated, i.e. something or someone set aside or dedicated to engage in worship to Jehovah, free of any physical flaws (e.g. Levitical law required sacrificial animals to be free from blemishes). 'Defilement' is the process by which something or someone becomes 'common', 'unholy', even 'unclean', and hence unfit to be offered to God. Defilement was always seen as the inevitable outcome resulting from sin (some of which are mentioned by Jesus in Matt 15:19, such as adultery). This is even reflected back in Genesis, e.g. Adam was driven from God's presence when he was cast out of the Garden AFTER having committed a sin; Cain similarly was driven out of God's presence AFTER killing his brother Abel, where the act of manslaughter rendered him as defiled. Adam and Cain were both left as unholy, due to their sins, both men unfit to remain in God's presence since they were defiled by their own actions. As explained in Deut. 28, God's punishment for sin sometimes manifested as undergoing loss of wealth, poverty, being sold into slavery, etc. However, ALL physical illness (whether it be the visible skin lesions of the leper, or the withered limb of the lame) was almost always considered a conclusive sign of the person undergoing God's punishment for some sin; the sick and disfigured were assumed to be 'defiled', hence unfit to serve in His presence in the Temple (God's Earthly 'home'). The sick and disabled were driven off, just like Adam and Cain. So although Jesus was speaking of 'spiritual defilement' making a person unholy (i.e. unclean in a religious sense), there was no differentiation in the 1st Century CE between 'spiritual defilement' and the physical manifestations of sickness: they were largely assumed to be the same, where one indicated the other. It's only in modern times that we've disconnected the concept of someone being sick or disabled from assuming the person is a sinner being punished by God. We KNOW better now, thanks to medical science. But not so in Jesus' time, where the sick were specifically prohibited from entering the Temple, automatically assumed to be defiled due to some unknown sin. As the Bible shows, the practice of discriminating against the disabled continued even past Jesus' time, since 'the lame' are depicted in Acts 3 as gathering near the Temple entrance to beg for alms from those entering and leaving the Temple. And if the Holy Temple in Jerusalem existed in modern-day America, it would hardly be compliant with modern-day laws protecting the disabled against discrimination (i.e. the ADA, Americans with Disabilities Act); presumably there were no accessibility ramps for the wheelchair-bound to enter. Jesus' words in Matt 15:20 are thus demonstrably-FALSE, where Jesus was saying sicknesses are the result of sin; in essence, he's blaming the victim (his words would be dangerous if the meaning of his words were actually understood by more believers, rather than being swept under the rug, as if he never said them). Apolegetic #1: Jesus was protesting the unnecessary "burdensome man-made rules" and pointless rituals which distracted many Jews from being closer to God. Even if hand-washing before meals was a useless and ineffective ritual ('Netilat Yadayim', washing hands while reciting a special prayer), would THAT ritual constitute such a "great burden" or distraction from worshiping God? Need I point out that the individual is actually PRAYING to God while washing hands? The rabbi doesn't seem to be 'overly-burdened' by it, does he? No signs of straining, discomfort, sweating, etc.? I'm having a hard time following the logic: are Christians actually claiming the reason Jews rejected Jesus as their Messiah was partly because of the distraction of a rule requiring reciting a special prayer while washing one's hands before eating? And the million dollar question is, do YOU, dear reader, refuse to wash your dirty hands before eating 'finger foods', or eat off dirty unwashed plates and cups, complaining that such man-made rituals distract you from your relationship with God? And if you DO wash hands before eating, you probably shouldn't use the defense above, unless you're willing to risk being viewed by non-believers as someone who's more hypocritical than a Pharisee, since you'd be saying you believe one thing, but then doing something completely otherwise (AKA, 'not putting your money where you mouth is'). You're also not demonstrating much faith in Jesus, since he SAID hand-washing was unnecessary. In fact, one might even say washing one's hands before eating a sandwich is tantamount to calling Jesus a fraud! And since the Bible depicts illness as punishment from God for some unknown sin (or even as a loyalty test, per the Book of Job), wouldn't washing one's hands and dishes to avoid food-borne illness actually constitute your attempt to side-step God's will, AKA committing a sin? For that matter, wouldn't taking ANY medicines (antibiotics, homeopathic remedies, even vitamins, to treat or prevent colds and flus) be a sin, too, since that would be an attempt to avoid God's punishment (like Adam and Eve, who hid in the Garden)? Despite no Biblical prohibition explicitly barring the celebration of one's birthday, Jehovah's Witnesses point to the unflattering depictions in the Bible associated with birthdays (e.g. the beheading of John the Baptist at King Herod's birthday) to explain why they don't. However, hand-washing is consistently deprecated in the Bible, not only associated with the hated Pharisees, but also with Pontius Pilate (in Matthew 27:24, Pilate washing his hands is mentioned immediately after sentencing Jesus to death). So the murderers of Jesus, both Jewish and Roman alike, are depicted as performing hand-washing. The Biblical polemics against the practice are clear-cut, since the uncommon practice at the time was specifically written into the accounts of both Matthew and Mark, a practice that is associated with 'evil-doers'. So shouldn't JWs refuse to wash their hands before eating, since Jesus said it was simply a "man-made" rule, it doesn't defile anyone, AND elsewhere the Bible takes a dim view of the practice? Apologetic #2: Jesus WAS aware of "the truth" of hand-washing and microbiology (after all, Jesus played a role in creating such disease-causing pathogens!). However, Jesus didn't come to Earth to teach humans about the scientific principles of food safety or hygiene, but to deliver a message of salvation, offering truly-purifying waters that lead to eternal life. His audience would be distracted from his message if he challenged their incorrect thinking about science. Well, there's nothing like making a claim, only for later evidence to be discovered that ACTUALLY validates the claim (like when secular scientific methodology eventually catches up to be able to verify the utility of hand-washing). In the world of science, such claims are called 'predictions', being the equivalent term for that used in religious discussions: 'prophecy'. Einstein's 'hypothesis of relativity' was eventually promoted to the status of a theory after multiple predictions were later experimentally-verified to be true, using different approaches to test the hypothesis. But who was it who offered many such prophecies, claiming that we would know he was sent from Heaven after the prophesized events came to pass, since he claimed to possess Heavenly fore-knowledge? Wasn't that Jesus? What a missed opportunity for Jesus to point to God's Glory by offering practical and useful knowledge to humanity, serving as concrete proof of not only being Divinely-inspired, but evidence of his Father being the 'Intelligent Designer' who's association makes Jesus intimately familiar with the basic details of his Father's designs (which includes bacteria and viruses). "Verily I say to you, there's tiny living beings called 'bacteria' that are smaller than insects which are invisible to the naked eye, but they can cause sickness and disease in humans when they enter the body! Washing your hands before eating is a GREAT way to protect not only yourself, but to reduce their transmission to others! There's going to be a Dutchman who comes along in about 1,700 yrs with a device called a 'microscope', which a Frenchman will later use to confirm this, verifying all of this knowledge as God-given truth." There's no words like that found anywhere in the Bible. Nada. And even if Jesus didn't care to explain bacteria and disease, he didn't have to do that: he could've approved of hand-washing (if only to avoid ending up on the wrong side of history), and Jesus didn't even have to ACCEPT the Pharisee's man-made rules; he just needed to NOT specifically REJECT the one rule he did. Obviously he DID reject it, and in doing so, Jesus appears to modern men to be just another ancient mortal who was mistaken on a basic scientific fact we take for granted. Another MAJOR problem with the apologetic above (claiming it would be too much of a distraction if Jesus taught principles of hygiene) is the Bible actually undermines that claim, often depicting Jesus demonstrating concern for the immediate needs of people, caring about the health, safety and well-being of large crowds in his time on Earth. For on at least TWO occasions (Matt 14:13, Matt 15:32), Jesus performed the miraculous 'feeding of the multitudes' after delivering a sermon, e.g. 32 Then Jesus called his disciples unto him, and said, "I have compassion on the multitude, because they continue with me now three days, and have nothing to eat: and I will not send them away fasting, lest they faint in the way." Jesus showed compassion for 9,000 humans in the here-and-now, feeding them so they wouldn't pass out from hunger on their way home. Would it have been too much to teach humanity a short lesson on food hygiene, so they didn't faint away from severe dehydration (due to diarrhea, resulting by food poisoning) the day after they ate fish and loaves with their unwashed hands? Jesus offered a 'model prayer'; why not a 'model hand-washing'? Jesus was a strict observer of the Torah and was protesting Pharisaic hypocrisy. Sure, Jesus was accusing the Pharisees of selectively 'cherry-picking' which passages in the Torah they followed, and adding others by relying on questionable eisegesis (i.e. shoe-horning one's desired doctrinal interpretation into the text, rather than allowing the doctrine to follow). Jesus accused them of hypocrisy, no doubt about it. Here's an article explaining how Jesus seemed perfectly fine following oral traditions of the Pharisees during his Last Supper (Mt 26:26), thanking God BEFORE the meal was consumed, and not AFTERWARDS, the temporal sequence suggested by a literal reading of the ambiguously-worded Deuteronomy 8. As explained in the article, the custom of offering a blessing AFTER the meal is consumed is practiced by many observant Jews to this day, found in the Birkat Hamazon (Grace After Meals). The scriptural ambiguity was noted in the past, and the Pharisees wanted to be on the "safe side" by offering thanks BEFORE meals. The Pharisees are hardly to be blamed for fearing a God who repeatedly threatens to kill humans for committing even minor infractions of the Torah (see Numbers 15:32, where a man is stoned to death for the horrific offense of picking up sticks on the Sabbath!). In any case, despite protesting the Pharisees for their hypocrisy, Jesus seemed quite willing to do a bit of 'cherry-picking' of his own (and I'll leave it to him to explain how delivering such diatribes against his enemies serves as an example of 'loving one's neighbor'). Isn't that yet another missed opportunity to TEACH humans how to construct inexpensive and effective water filters and purifiers, using the commonly-available natural materials present not only in the present day, but also in Jesus' time to remove impurities? It turns out that bacteria and viruses don't actually care one bit about the religious beliefs of the person who's hands they're living on, since they're agnostics. They wash off just the same, whether the person is a Christian, Jew or atheist! But even if one concedes that ritual hand-washing may not have been as effective as it would've been if it were done differently, that's yet another missed opportunity for Jesus to teach humanity the PROPER METHOD of washing one's hands, where timing the length by singing two choruses of "Jesus Loves Me" works just as well as singing "Happy Birthday" twice. Wouldn't THAT have left a lasting legacy, offering tangible circumstantial evidence that served as proof of Jesus having Divine insight into a major cause of human illness? Hence apologetic #4 is a non-starter, too, since it's temporarily kicking the can down the road, but triggers more problematic questions than it resolves. Was Jesus intentionally TRYING to retard human advancement and knowledge? Was denouncing hand-washing Jesus' version of the Tower of Babel, God's intentional act of sabotage attempting to interfere with human achievement by temporarily preventing humans from working together, blocking them from cooperating to improve their existence in the here and now, rather than focusing on His Great Here-after? Or was this just an unintended consequence of the REAL reason underlying Jesus' dismissal of hand-washing, using it as an example of Pharisaic over-reach gone amok? I'm going with the latter, since there's a much-more-rational, more-probable and benign explanation that answers the question posed in the title of the article. Despite labeling Jesus' healing as 'miraculous', there's really no mystery about the mechanism through which Jesus claimed to healed others: it's identical to the way humans in other ancient cultures believed healing operated; it's even openly discussed in the Bible. As explained earlier, disease was viewed as a punishment from God. HOWEVER, the disease was ALSO believed to be cured when God granted forgiveness to the sinner, whether it was requested by a 'sin offering' mediated by a Temple priest, or in later times, by a wandering healer who claimed special powers of healing due to having a Father in high places. Therefore, modern men can label the ancient thinking of the mechanism by which healing was understood to have occurred with the name, 'the Forgiveness Hypothesis of Curing Disease'. Jesus claimed to heal by having been granted the authority by God, not just to mediate on the behalf of the sick (like the Temple priests claimed), but to be able to forgive human sin directly. If it had been known at the time, Pasteur's 'germ theory of disease' likely would've been viewed as just as much of a threat to Jesus' healing claims as the wandering healers were viewed as a threat to the Temple priests in Jerusalem! Both were bad for the business of the other, basically competing for the same customers (Temple priests took a cut of the offerings as their payment for services; although he didn't accept money, Jesus was actually doing something far worse: he was giving away his healing services for free)! Thus Jesus appears to modern men to be just another ancient mortal who was mistaken on a basic scientific fact; but in that regard, Jesus has good company. Where's another example of a human mortal who was wrong on a basic principle of biology? The famous Greek philosopher Aristotle (4th Cent BCE) mistakenly believed the organ of consciousness in humans was the heart (in the torso), and NOT the brain (inside the skull). Aristotle believed the heart served as the center of human cognition, where all the torso organs (e.g. liver, kidneys, gall bladder, etc.) were believed to play a role in cognitive and emotional processes. Aristotle even left his thoughts in written form, explaining WHY he concluded as he did. It's interesting to read his arguments in hindsight when we know the correct answer, as his reasoning was basically sound (e.g. he noted how the heart beats faster when emotionally-excited, etc.). Nevertheless, as an modern-day kindergartener can tell you when you ask them to point to where thinking occurs (they point to their head! ), Aristotle clearly WAS wrong: his error was conducting only 'thought experiments' and trying to reason his way to the correct answer. It turns out Aristotle failed to actually study any patients who'd experienced head injury, a mistake which Alcmaeon and his colleagues didn't make which led them to the correct conclusion. Of course, no one believes Aristotle is the Son of God, and no one places greater weight on his sayings than they do with Jesus, who ALSO believed humans thought with their hearts (even though he lived almost 300 yrs. AFTER Aristotle, long after such basic facts were known by the better-educated Greeks who lived far away from Galilee, where Jesus roamed the countryside). The misconception originated with the ancient Egyptians (circa 2,000 BCE), considered to be the top-notch healers of their day and the experts on human anatomy; their vast experience performing dissections and embalming were skills gained via preparing mummies for their after-life journey to stand before their God, Osiris, who'd examine their life's actions in the "Weighing of the Heart" ceremony. Egyptians believed all events were recorded in their hearts, which was packed inside the mummy (we now know memories are stored in the brain as synaptic connections; the Egyptians actually discarded the brain during the mummification process, since they didn't know the actual anatomical role it played). Of course, the Hebrews had strict prohibitions preventing contact with the dead (to avoid tuma, "impunity" as described earlier), so they had no choice but to rely on their more-experienced neighbors, the Egyptians, for their understanding of human anatomy. It's interesting to note the Hebrew or Greek word for 'brain' doesn't appear ANYWHERE in the Bible: odd, since why would God allow the brain, the very pinnacle of His creation of humans to go unrecognized, instead allowing the credit for cognition and thinking to go to the pump of human blood, the heart? It also makes one wonder why Jehovah wouldn't use the Egyptian's anatomical ignorance as the basis to differentiate Himself from Osiris, the so-called 'false' God of the Egyptians, pointing to Osiris' ignorance of basic human anatomy? Isn't it reasonable to expect an "Intelligent Designer" would NOT be ignorant of the basic functions of the parts of His design? Would you assume someone's claim to be say, a watchmaker, if the person doesn't even know what role the hands of a watch play, or what the watch band or mainspring does? Why should any modern-day kindergartner know more about where thinking occurs than two deities did? Unlike the brain, the Bible contains MANY references to the kidneys: Jews were supposed to offer animal kidneys as a sin offering after making a poor decision to sin. God demands it in the Torah, in Leviticus 9. At any rate, Jesus clearly believed the words spoken by God in Genesis 6, referring to "the evil thoughts in the hearts of man." The authors of the Torah believed as all other men of their time (where everyone relied on Egyptian thinking), and Jesus believed what the Torah said, since that was the common belief amongst the Jews in Palestine, regardless of sect. 1) illness indicated God was unhappy with an individual, as a result of some unknown sin. 2) humans thought with their hearts, not their brains. 18 "But those things which proceed out of the mouth come forth from the heart; and they defile the man. 19 For out of the heart proceed evil thoughts, murders, adulteries, fornications, thefts, false witness, blasphemies"
All of that makes perfect sense, if you understand Jesus believed sins caused disease as a punishment from God, and sins proceed from ones' thoughts, which Jesus ALSO mistakenly believed were formed in the heart, which controlled the mouth. Of course, the typical Christian apologetic response is, "Jesus was using the 'thoughts of the heart' as a figure of speech!" Unfortunately, that claim doesn't hold water, since while it's true that in modern times we use the 'heart/brain' misconception as a poetic figure of speech, it once WAS believed as literal truth (as shown by the written records left by educated men like Aristotle). The 'thoughts of the heart' as a figure of speech persists even now, but that's mostly due to it's appearance in the Bible and continued use by Christians. The problem is Jesus didn't just stop at saying sin defiles a person; he took the extra step of saying eating with unwashed hands was NOT defiling, which is clearly incorrect. "Frequent hand-washing is the single-most important means of disease prevention." Hand-washing is inexpensive to perform, easy-to-do, and most importantly, it's EFFECTIVE. It WORKS. Of course, it wouldn't be sporting NOT to force people to ignore the extensive evidence staring them in the face: better to set up rules that reward the uneducated, and punish those who'd be born 2,000 yrs. later who DO actually know something about the history of science and medicine, those who've LOOKED under microscopes to study bacteria and viruses, and those who've successfully treated diseases with antibiotics and antivirals where the patient actually IMPROVED and RECOVERED despite not having sinned or having been forgiven for their sins. Better to make the mere mortals who dare move into Jesus' healing territory deny the plainly OBVIOUS truths that are KNOWN without doubt, since they apparently should just forget all that "man-made" wisdom and just accept some fantasy. Sure, and that seems fair to you? If Jesus had any Divine insight, he'd not have turned water into wine (and for WHAT reason, but to prevent the hosts from feeling social embarrassment at a wedding reception, and to entertain the audience with magic tricks? ), but he'd have turned it into potable water. Better yet, why not turn that water into wine, not for serving to wedding guests, but for distilling to obtaining ethyl alcohol, the active ingredient found in alcoholic drinks, the same agent found in hand sanitizers, e.g. Purell? Teach the disciples how to distill wine to obtain ethyl alcohol so they could MAKE Purell on their own by the barrel, and thus teach mankind to do the same so they could clean their hands of bacteria and viruses even when far from available water? It's not THAT difficult of a process: prison convicts make stills in their cells, using smuggled parts readily-available not just in the 21st century, but 1,000 yrs. before Jesus lived. All that was lacking was the idea, the direction, even the inspiration and motivation to help others. Fortunately, some compassionate humans aren't just sitting around, waiting on others to provide an answer to such easily-addressable problems; some are acting in the here-and-now to help the needy. Seeds of Hope International Partnerships (SOHIP) is a group of volunteers that uses a systematic approach to solving health issues in Africa, where SOHIP volunteers first show communities how to construct and maintain their own water purification systems using only readily-available natural materials (which were available in Jesus' day, as well), then showing residents how to benefit from their newly-available clean water by teaching all residents about the principles of hygiene (including the cute little girl seen in the photo above). 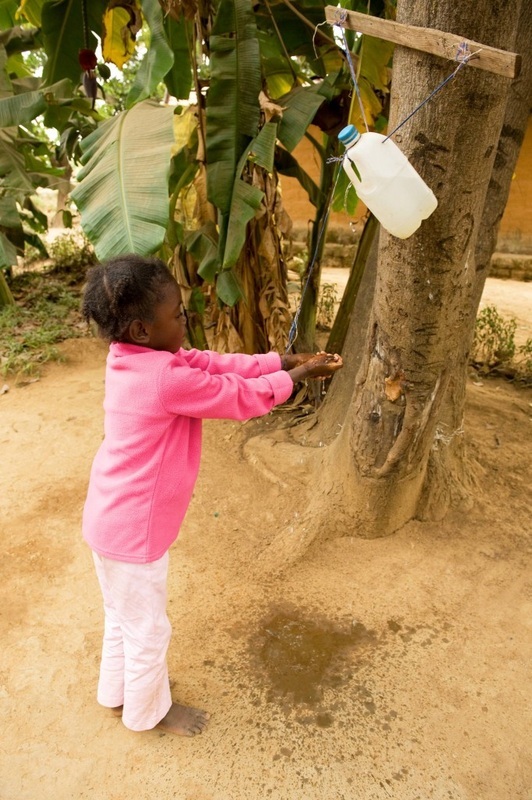 SOHIP is actively reducing the spread of infectious diseases by teaching basic hygienic practices, thus preventing needless deaths from water-borne diseases in Africa, where it remains a major problem as a cause of preventable sickness and death. Compare and contrast to Jesus, who poo-poohed basic hygienic practices on the basis of some theological beef he had with the Pharisees. Organizations like SOHIP are not just sitting around on their hands (unwashed or not) waiting for an answer to prayers: they're actually DOING SOMETHING. If you want to contribute to SOHIP, donations are accepted here, on their website.